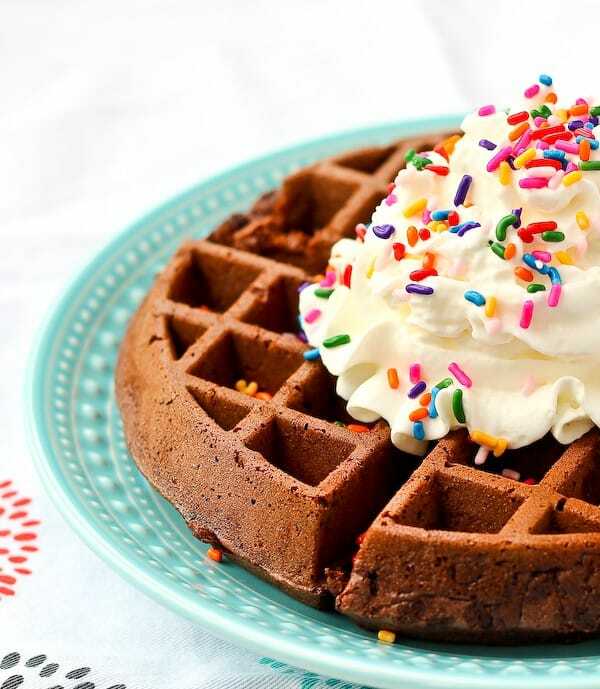 Brownie waffles – otherwise known as brownies in 3 minutes. Otherwise known as dangerous…dangerously delicious! I’m in the midst of planning a retreat this summer. I’ll be meeting up with nine other food bloggers in beautiful northern Michigan. We’ll be learning from each other, experiencing all the things northern Michigan has to offer, getting to know each other better, and of course, we’ll be eating. Probably farrrr too much eating. One morning we’ll gathering in the kitchen together to make waffles. Seeing as we’ll need to crank out a lot of waffles quickly to feed 10 hungry food bloggers, KitchenAid was generous enough to send us some of their Waffle Bakers to use. These beautiful countertop appliances put out two perfect Belgian waffles in 3 minutes. We could get the whole crowd fed in 15 minutes! And let’s just say I’ve been practicing, a lot. 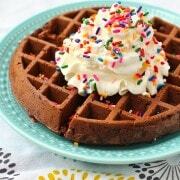 I almost feel bad posting this recipe because it’s barely a recipe…but it’s a brownie waffle! If you haven’t tried this, you must. No shame in my game — even right down to the brownies from a box. I swear, Ghirardelli brownies are the best around. Every time I make them for anything, I get a compliment on my delicious brownies. And of course, I happily oblige. “They’re Ghirardelli!! !” Again, absolutely no shame in my game. I own every shortcut I take. When they taste this good, who freakin’ cares if you didn’t get out a measuring cup for flour? Good news, they aren’t! It’s as easy as whipping up the brownie mix (add in an extra egg!) and throw the batter in the waffle maker! In three minutes, you’re dining on the perfect brownie waffle — soft on the inside and crispy on the outside. The hardest part is trying to decide how to top it! Whipped cream, sprinkles, strawberries, hot fudge, caramel sauce, ice cream….all of the above? Remove and enjoy topped with fruit, whipped cream, or ice cream. Hot fudge would be good too, just sayin’. And sprinkles are always a good decision. Verdict: Too dang good. They’re best fresh but still pretty good after a few days storage in an airtight container. Husband’s take: Remember the illegal comment? Difficulty: Easy! Warning – it might take you a little time to clean your waffle maker but it’s fully worth it. Need more chocolate in your life? 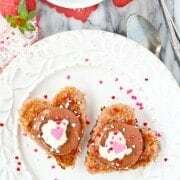 Try Flourless Chocolate Cake with Toasted Coconut and Ganache, Irish Coffee Ice Cream Pie with Whiskey Ganache, Chocolate Pudding Pie, Slow Cooker Chocolate Fondue, Chocolate Lasagna from Center Cut Cook, or No Bake Chocolate Cheesecake Cups from Just a Taste. Or try them all. That would be good too. Epic fail! We have a really good waffle maker, and every attempt was disastrous, lol! 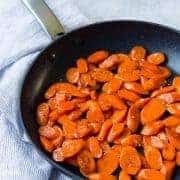 Spraying/not spraying…less batter/more batter…cook longer…nothing helped! We ended up having to scrape and pick out the “waffle” each time. We just had piles of brownie clumps, plopped a scooped of ice cream on top, and added some toppings. Flavor was all there, but presentation was lack luster! Oh no! I’m sorry to hear that! Sounds like you made a delicious improvisation though! They burned on the outside before the inside baked. I’ve never had that happen! Does your waffle iron have different heat settings? It sounds like it could have been turned up too high and maybe a lower temperature would be better? Strange, I didn’t have that issue! Did you cook them long enough? PS: I’m craving ice cream and ganache big time now! Those two things can fix any wrongs. hoooow have I still not done this??? MUST change that! I totally make these, but the trick is to grease the waffle iron SUPER well, or things get crazy! 3 minute brownies for breakfast is EXACTLY my idea of a fabulous morning!! Love this! 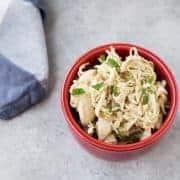 These look amazing, Rachel! 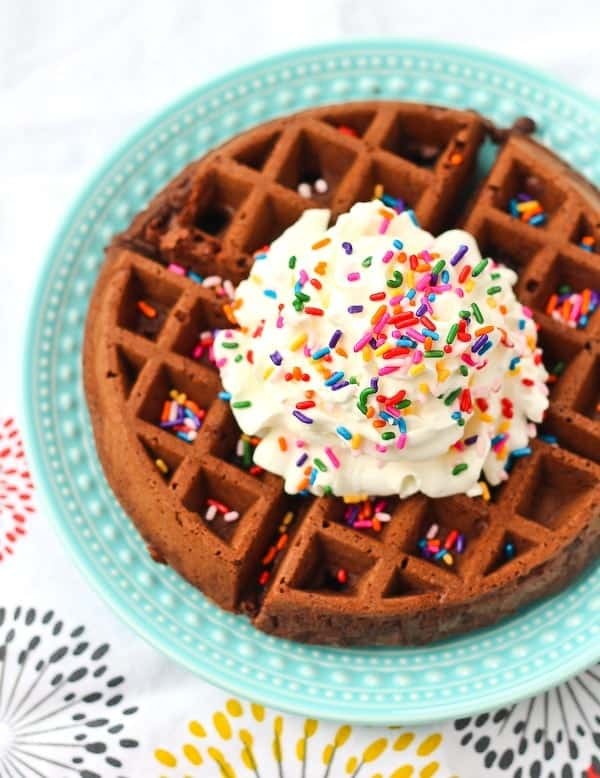 Brownies in waffle form sound like the perfect breakfast treat! Wish I had some this morning! Ohhh this is most definitely how you start your day!! My favorite brownie mix, too! That is my favorite brownie mix too!! This is a genius idea. I can’t wait to try it out! 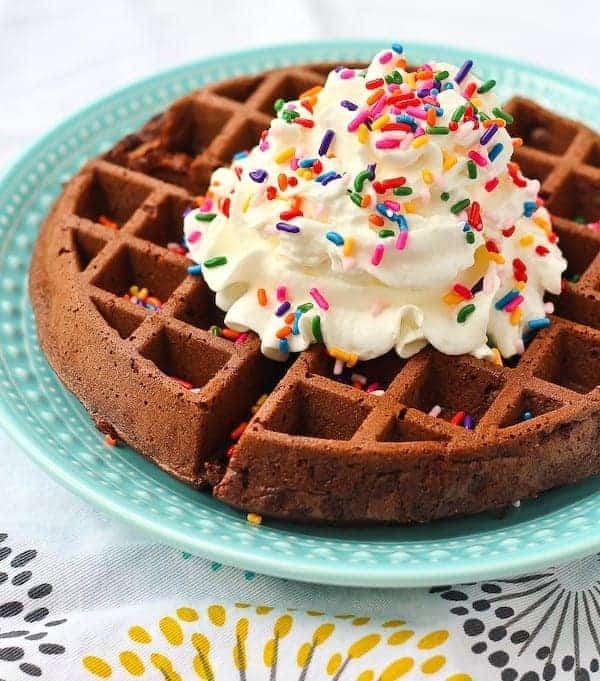 Brownie waffles for breakfast, SIGN. ME. UP!!!! Have a wonderful time planning and going on your retreat!! These are incredible! I kind of want 4 of them right now!! 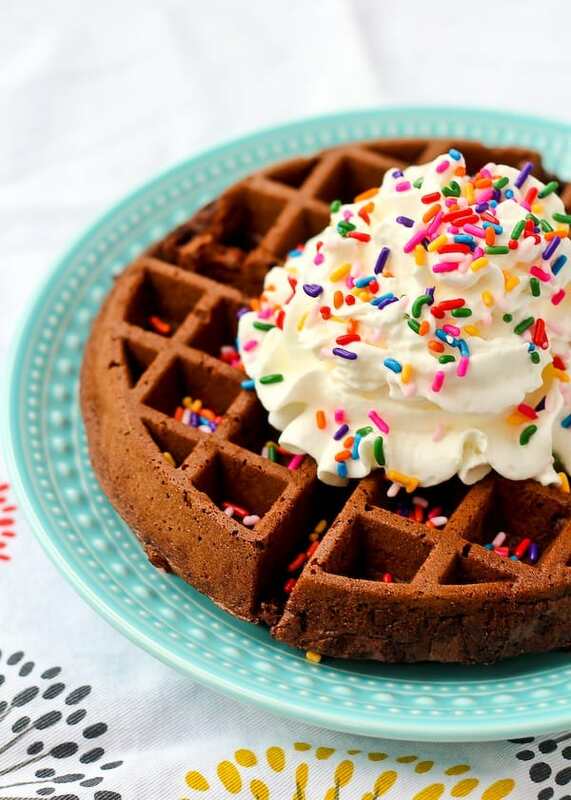 Wow, brownie waffles that’s genius!